Like last month, here’s this month’s update on travels, events, and articles (including a first for me!). In my travels if you’re in the area and want to connect, contact me. Big news: my first article as lead author in a medical journal (right)! (In the world of medical journals, being listed as the first author is a big deal.) 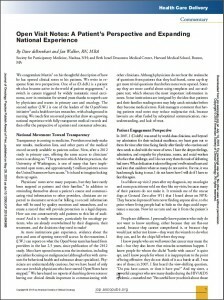 Open Visit Notes: A Patient’s Perspective and Expanding National Experience, in the Journal of Oncology Practice, with Jan Walker RN MBA. Thank you to the OpenNotes team for managing this! Amazing Ginny’s amazing knee surgery: my post last week has been updated with amazing new videos of her moving around. That post has traveled: it got modified and posted on the much-read Glass Hospital blog, which was in turned picked up by the more-read MedPage Today update, and in turn caused a post about patient engagement on the Christ Church Charlotte nurse ministry blog. This spring I had a couple of cases where people said “I wish I’d known you were coming – we could have had coffee!” (That’s always compelling to me…) So I’m going to try publishing a monthly update (more or less) of upcoming travels, newly added future events, and maybe a few other things. Short & sweet. Thank you to Casey Quinlan, a focused production machine if I ever saw one, for making this happen! June 7-13, Lucerne, Switzerland: IKF’s annual Swiss tour. Multiple keynotes and private meetings. June 16-17, Chicago: NEHI’s National Healthcare Innovation Summit. Attending. June 17, London (via web): The King’s Fund, Digital Health Days Congress. Speaker. Link to come next week: June 26, 4:30 pm New York time, webcast: 20 minute speech “Being Heard as Possibility,” part of Rebel Jam, hosted by Rebels At Work, Corporate Rebels United and Change Agent Worldwide. Mid September: 10 day tour of Alaska! These people are getting it bigtime and spreading the word! September 23-24: Medicine-X | Ed Bringing e-patient thinking to the medical education curriculum! “Open Visit Notes: A Patient’s Perspective and Expanding National Experience,” in ASCO’s Journal of Oncology Practice. It’s open access (free), to allow reading and sharing by patients. Full text, or PDF of the print pages; article extract page here. Thank you to Beth Israel Deaconess OpenNotes team, and to the journal for making it open access. May issue of ImproveDx: Newsletter of the Society to Improve Diagnosis in Medicine. In “Improving Communication of Test Results in a Changing World” by Susan Carr.